I was fortunate enough to spend some of the weekend up at New York Comic Con. When approaching many of the booths, vendors would ask “What are you into?”. I’d usually respond “Capes, Horror…”; that’s as far as I’d ever get before the vendor would say “Have you read Wytches?”. I had not and this apparently needed to be remedied. When I finally caved at the third or fourth booth this demand was made, the checkout guy’s eyes got wide. This is important as anything that stops you from reading Wytches should be immediately dealt with. 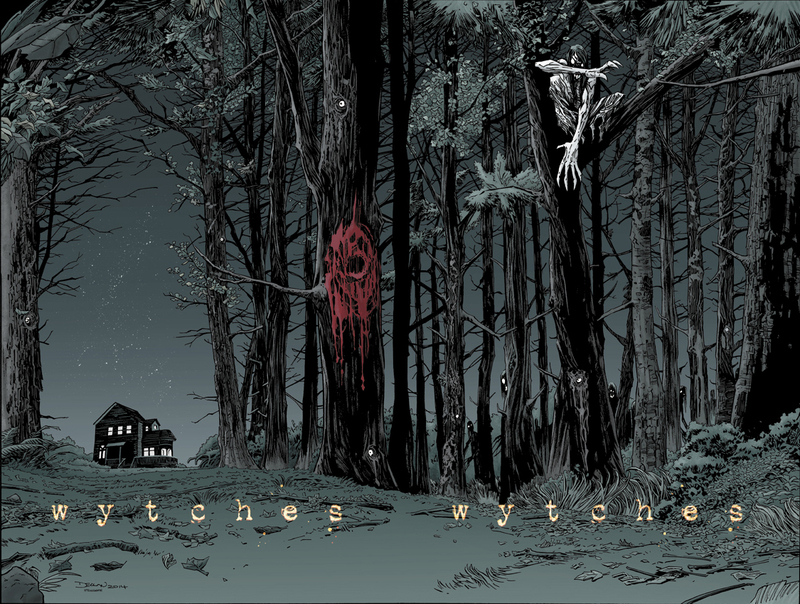 Wytches is the story of a family, a family with a past of trauma and suffering. They carry this weight together as the best horror protagonist families do: regretful father Charlie, anxious daughter Sailor and disabled mother Lucy are bound together in crawling out of their own wreckage. They have moved to a new town for a fresh start, but unfortunately Sailor’s reputation as a person of interest in the disappearance of her vicious bully precedes here and the freshness begins to wear off as suspicions surround her. Also there is something wrong in the woods and it is encroaching on their home. Parental fears weave through the story, edited with flashbacks, memories and visions in a way that manages to unsettle you the whole ride. 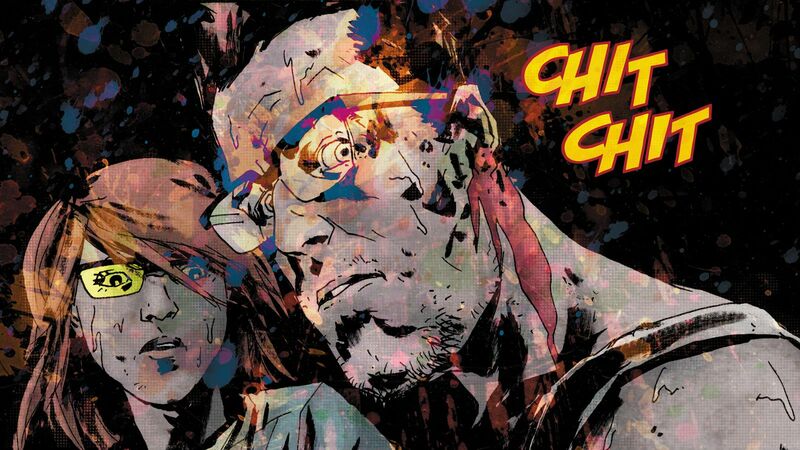 It’s hard to pull off a jump scare in a comic book, but Wytches does it. It is also important to note that the whole comic stinks. Not as in the comic is bad, but there is a splatter and patina overlayed over the art that keeps it looking dirty and smelly. This maintains the vibe for a comic in which smell plays an important part in the role of the monster, the eponymous wytches, as they select their victims. Charlie, the father, has the Stephen King creator-as-patriarch starter set, but the device isn’t overused. The plot of his upcoming young adult novel is just used to reveal the desires of his heart so you know where he is at. The relationship between Charlie and his daughter Sailor is the crux of the book. It’s warm, sad, distressing and overall realistic. As the anxious father of daughters, one of whom who bears early signs of anxiety, Wytches hits me right were I live. Wytches captures the constant low-level fear that undergirds parenthood: we can’t protect our children from ourselves much less anyone else. We don’t suddenly become good, fixed, functional people when we have children and our mistakes and shortcomings become part of the environment kids are forged in. They become the audience for our best and our worst and they take it all in as material to shape themselves out of. When our children start then dishing it back out, we know the source and grieve that it is us. That all happens before we even consider the dangerous, chaotic and complex world we birth them into. We’d do anything to rescue them from being exactly like us and having to face the world as is, even if we had to fight through the dark and monster filled forest to do so. Honest, dark and loving, Wytches gets it and displays this reality for us to reckon with in its’ pages. Wytches is the new comic horror hotness, It’s a tight and visceral story by Scott Snyder who you may remember from a Batman comic you liked and Jock from that one Green Arrow comic you read. It was optioned for a film pretty much the minute it was released, so get onboard now so you can lord it over your friends. Kevin is a husband, father, huge horror fan, and so-so pinball player. He has two adorable children, a gorgeous wife, and an addiction to all things nerdy. When he's not busy with the family, he's working at the church, watching a movie, or reading the latest issue of any number of comic books. His daily routine isn't too dissimilar from the life of Preacher, albeit a bit less violent.